Join us for an inspirational 5 day, 5 night Photography Adventure of the New Zealand's South Island Mackenzie Region. Hosted by Rachel Gillespie and Full Time Photographer Rina Sjardin-Thompson and Landscape Photographer Neil Protheroe. Also joined for an evening of astrophotography with Jordan McInally of Undersoul Photography. We have joined together to bring you an Astrophotography and Landscape Photographic Learning Experience all in one. June 2019. The NZ Kiwi Adventures Photography Tours are a photographic adventure of a lifetime. Rina, Neil and Rachel both spend time each year in the Aoraki Mackenzie Region and invite others to join them on this amazing photographic adventure. Rina Sjardin-Thompson has had multiple images featured in New Zealand Geographic Magazine, plus is regularly published in a variety of other newspapers, journal and magazines. Successfully running workshops for beginners for over two years, Rina is passionate about sharing her knowledge of traditional, unedited photography, preferring to keep her work "basic and simple”, and “allowing the landscape to speak for itself". "I recently had the pleasure of participating NZ Kiwi Adventures on a photography adventure, in June, around Mt Cook and the Mackenzie. I found the adventure was well organized and fully flexible to cater for weather conditions. I was able to tap into the Tutor's expertise and knowledge, either out on a shoot or in the conference room. The locations we will be visiting are hotspots for scenic landscapes, but in particular for photographing the night sky. The Aoraki/Mackenzie International Dark Sky Reserve is the world’s largest, and if you haven’t ever viewed the Milky Way Galaxy with the naked eye before, then you will be amazed by the starry skies here! They offer a unique photographic opportunity. So what will I learn on the tour? Whether you’re a hobbyist photographer or a seasoned pro, these tours will cater for all. Rina and Neil will guide you every step of the way with personalised guidance and tuition. We will cover all the basics of equipment, settings and techniques to help you get the best shots possible. You will also learn how to process your images, with a step by step guide in either Adobe Lightroom or Adobe Photoshop. And they will also take you through the beginning steps required for capturing time-lapse. For astrophotography - lenses with a maximum aperture between f/1.4 and f/4 and a focal length between 10 and 24mm are ideal. For example - a 14mm f/2.8 lens is perfect, or even a zoom lens with a minimum focal length of 24mm at f/4 would be fine too. Laptop computer with Adobe Lightroom or Adobe Photoshop installed. A headlamp or torch - one with a red light mode is best. Spare camera batteries - always good to have backup batteries ready to go. Spare memory card(s) - memory cards can fill up fast and also fail, so good to have a spare. intervalometer for photographing timelapse - some camera models have a intervalometers function, so they don’t require external hardware. Portable external hard drive for additional data - we shoot in raw, so tend to use a lot of data, especially when photographing a time-lapse. Extra hard drive space can come in handy. *The night photography sessions are weather dependent, but alternative activities will be held if they weather doesn’t give us the opportunity to head out. This is a special all-inclusive photographic workshop open to photographers of all levels of experience and enthusiasm. We will be spending our days in the magnificent alpine landscapes around Lake Tekapo, Mackenzie Country. 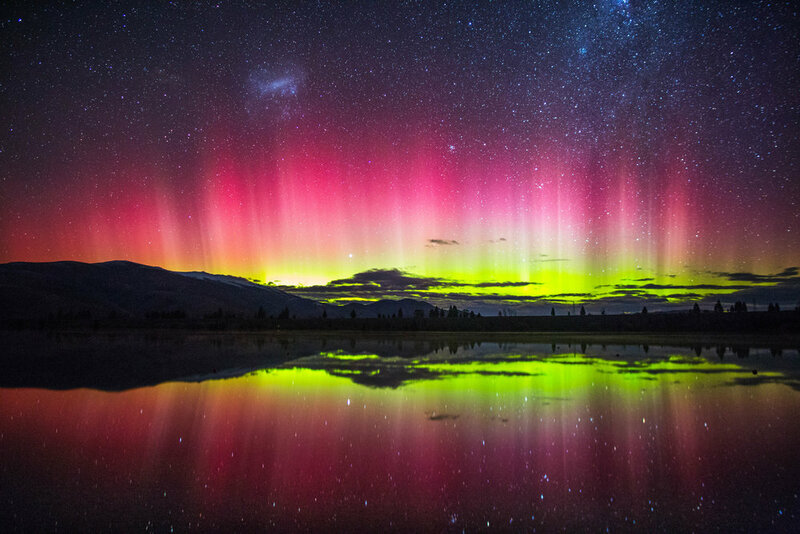 Lake Ohau and surrounds, and at night, we’ll be out shooting the amazing star-filled skies of the Mackenzie Basin. Expect to be up early, and out late! You’ll be hosted and guided by professionals who will offer one-on-one instruction, advice or reinforcement of the skills and techniques used in image visualisation, composition, exposure control, and post-processing. Learn how to capture the stars of the Milky Way as part of our astrophotography masterclass. This is a unique photographic adventure in one of the most scenic places in the world. and capture some awesome views of the alpine peaks from high up in our chartered Helicopters and Ski Plane Flights, yes you get to go on 2 flights! Moderate. You will need to be able to hike along easy trails, maximum 5km each way, with camera equipment. A deposit of 30% is required to secure your place. Numbers are capped to 12 people only with two photography tutors and two hosts at that maximum number. To apply to join us we have an application process to ensure this is the right workshop for you please contact us as this workshop is for intermediate to advanced level photography - Email info@nzkiwiadventures.com. Book a Trip of a Lifetime Now!